Looking For A Modern Mobile Disco & Talented DJ For Your Engagement Party? 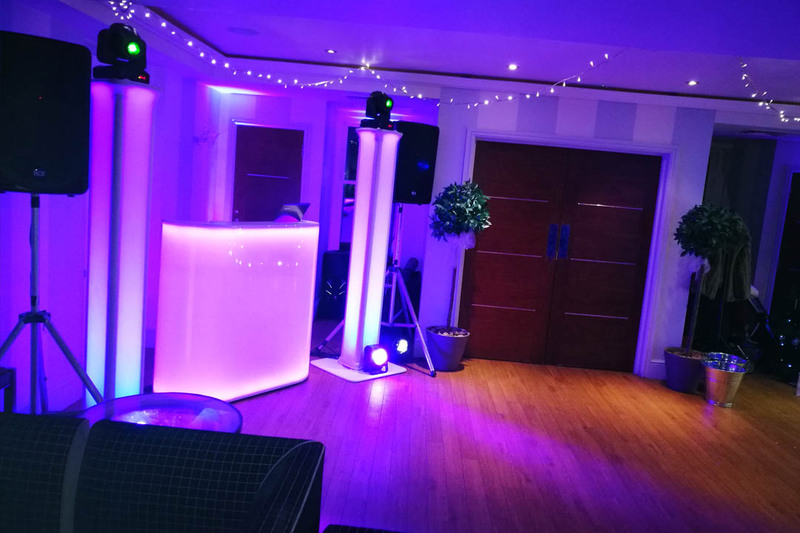 Party Dexx Mobile Disco & DJ Hire for Engagement Parties In Hampshire, Dorset & Wiltshire Including Southampton, Bournemouth, Poole, Salisbury & The New Forest. Congratualtions on your engagement! If you’re looking for mobile disco hire & an awesome DJ to help you celebrate and make your engagement party an epic night to remember, then you’re in the right place! At Party Dexx Mobile Disco our DJs are experienced, talented and reliable. They’ll arrive on time, play the music you love and read the crowd to keep people dancing all night long! We’ve over 14 years’ experience and have helped people celebrate more than 1000 happy events. So you can be sure that we know what works and how to create an awesome party atmosphere at your engagement party. We cover Hampshire, Dorset & Wiltshire including Poole, Bournemouth, Ringwood, Southampton, Salisbury & The New Forest. I just wanted to say a HUGE thank you for Saturday. Oliver was a fabulous DJ, accommodating, a good laugh and always smiling. My friends all had a great time, albeit still suffering, haha. I’ll defo recommend Party Dexx to anyone who’s looking for a great night!! Thank you so much for providing the disco. We partied all night which is just what we wanted, Alan was fantastic and our friends are still talking about it! We are recommending you to everyone we know! When you book Party Dexx you get a personalised playlist that lets you choose the songs the DJ WILL and WILL NOT play at your engagement party. On the night the DJ will play the songs you have requested, mixing them in with what he can see people responding to and what he knows works and gets people dancing, whilst avoiding the songs on your “Do Not Play List”. Our DJs are very talented at reading the crowd and will adjust the music to suit what you and your guests are actually dancing to on the night too. All our DJs have a large track library and will happily play any guest requests on the night. We can also provide music request cards for your guests to fill in and hand in to the DJ to help encourage requests. This is the perfect way to combine our DJ’s talent and experience with your music tastes, to make sure you get an awesome engagement party with everyone on the dance floor! Includes everything you need to create an epic party and make your engagement party a night to remember! A talented party DJ who can mix, beatmatch and read the crowd. High quality sound system for an epic party. Modern disco lighting that moves in time to the music to create a party atmosphere. 30 Track personalised playlist – You tell us the songs you want to hear! Funky GloBooth & Glotem Tower DJ Booth that changes colour in time to the music. LED Uplighting – Illuminate the room in your choice of colour and create the perfect place to party. 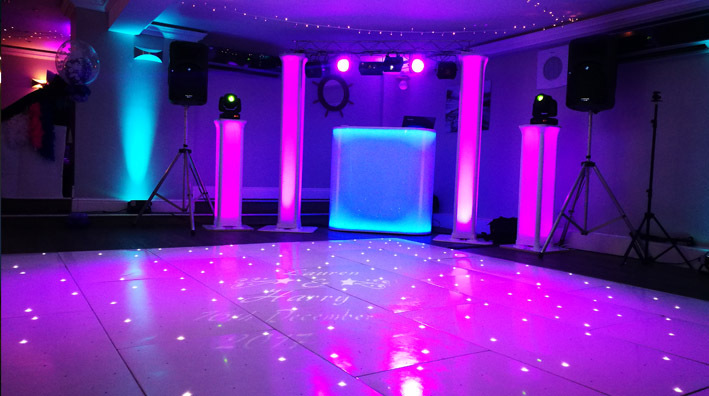 Personalised Spotlight – Project your name, age or message onto the dance floor. Based in Ringwood, Hampshire, Party Dexx provide party DJs and mobile discos for engagment parties in Verwood, West Moors, Bournemouth, Ringwood, Fordingbridge, Ferndown, The New Forest, Lymington, Lyndhurst, Christchurch, New Milton, Brockenhurst, Hythe, Wimborne, Poole, Southbourne, Salisbury, Downton, Southampton, Cranborne, & surrounding areas.